A dependable midsize sedan is a great choice for families and commuters near Avon, Indianapolis, and Plainfield. The classic Toyota Camry offers reliable performance, safety, and convenient features that help you have a fun driving experience. However, which trim of this great car is right for you? 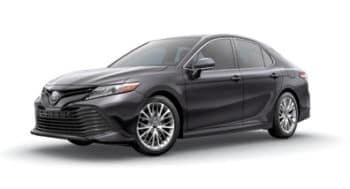 Andy Mohr Toyota wants to help you find out, which is why we put together this 2019 Toyota Camry trim levels review. Inside, you’ll find fabric trim seats and a 4.2-inch TFT Multi-Information Display. This dashboard monitor is where you can check what’s behind you with the integrated backup camera. This is also the home for your infotainment system, the Entune™ 3.0 Audio Connected Navigation Scout GPS Link App and App Suite. Above all, the Toyota Camry L is designed to keep you and your family safe. There’s 10 standard airbags, plus driver and front passenger Whiplash-Injury-Lessening seats and Lower Anchors and Tethers for Children. Both the Star Safety System™ and Toyota Safety Sense™ P (TSS-P) are standard to provide stability and driver assistance. These features and the safe design are what have made the Toyota Camry L a TOP SAFETY PICK+ from the Insurance Institute for Highway Safety (IIHS) and earned it a 5-Star Overall Safety Rating from the National Highway Traffic Safety Administration (NHTSA). 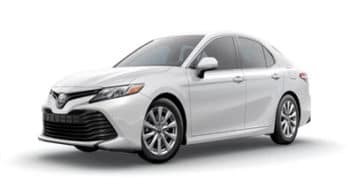 Browse LE InventoryThe next trim is the 2019 Toyota Camry LE. It’s powered by the same engine and transmission found on the previous trim. The interior has more options inside this trim. There’s an 8-way power-adjustable driver’s seat with power lumbar support. In the back, there’s a standard 60/40 split fold-down rear seat for easy access to the trunk. For comfort and convenience for your passengers, there’s a center armrest with cupholders. Shop XLE ModelsSport-inspired style gets added to our next trim. 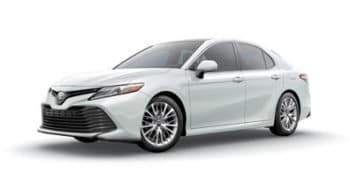 The 2019 Toyota Camry XLE has a bright metallic front grille, a chrome exhaust, and larger 18-inch silver machined-finish alloy-wheels. The style upgrades continue on the inside, too. There’s Tiger Eye wood interior trim, as well as leather-trimmed heated front seats. The front passenger’s seat is also an 8-way power-adjustable seat. Your controls get a big boost, too. There’s now a leather-trimmed steering wheel and a 7-inch TFT Multi-Information Display that’s compatible with Bluetooth®. A couple of driver assistance technologies come with this trim, including the Blind Spot Monitor and Rear Cross-Traffic Alert. You’ll have more control over your drive, too. The Toyota Camry XLE lets you switch between three modes: ECO, Normal, and Sport. 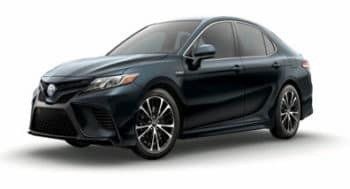 The 2019 Toyota Camry XLE V6 is the first trim to offer a different standard engine. It’s powered by a 3.5L V6 engine that produces 301 horsepower. It keeps the same Direct Shift 8-speed automatic transmission, though. To show off its added power, it has a dual chrome exhaust, a shark-fin antenna, and a sleek panoramic glass roof with front power tilt/slide moonroof. There’s a lot more to the infotainment system in this trim. The Entune™ 3.0 Audio Plus infotainment system with JBL® and Clari-Fi™ technology is connected to an 8-inch touchscreen. In addition to Bluetooth® wireless technology and SiriusXM® Satellite Radio, the system is also iPod-compatible with a USB 2.0 port. You’ll never have to worry about your phone’s battery with a Qi-compatible wireless smartphone charging station. For technology that feels futuristic, there’s a 10-inch color Head-Up-Display that projects customizable information, such as your speed, navigation, and outside temperature, right on your windshield. View SE ModelsGoing back to the original 2.5L engine, we move on to the Toyota Camry SE. This trim simplifies things while still emphasizing a sporty design. There’s a color-keyed rear spoiler and sport side rocker panels. The front grille is black with a sport mesh insert. The wheels are 18-inch black machined-finish alloy while there’s a single exhaust with dual chrome tips. The leather-trimmed steering wheel remains but the seat trim is now a Sport SofTex® with fabric inserts. Throughout the interior, there’s an embossed mesh trim. Browse XLE InventoryThe Toyota Camry XSE trim might have the boldest style of all the trims. It greets you with LED headlights with a smoke tint and leaves you behind with smoke-tinted taillights. It sits on 19-inch black alloy wheels and features a dual exhaust with quad chrome tips. When you step inside, you’ll find interior chrome door handles and a textured metal trim throughout the interior. You’ll have more control over your drive behind the wheel of this trim. The Toyota Camry XSE has steering-wheel-mounted paddle shifters to let you control the gear shifts. 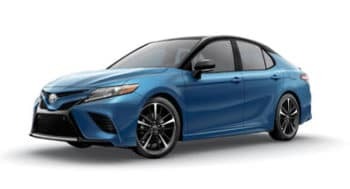 The final trim is the 2019 Toyota Camry XSE V6. It brings back some features, as well as the more powerful 3.5L engine. The roof gets a shark-fin antenna again, and the panoramic glass roof with front power tilt/slide moonroof returns. The Head-Up-Display, Qi-compatible wireless smartphone charger, and 9-speaker Entune™ 3.0 Audio Plus system with JBL® with Clari-Fi™ technology are also all brought back standard on this trim. Whichever trim looks right for you, this classic midsize sedan has so much to offers families near Avon, Indianapolis, and Plainfield. To learn more about each of the 2019 Toyota Camry trim levels and compare them in person, visit Andy Mohr Toyota and take a test drive.